Dog groomers use these super-absorbent microfiber towels to literally pull the water out of a dog’s coat after bathing. Plus any other household mess or spill! I’ve Been Using Them For Years! I was first introduced to these towels when I was a long-distance cyclist. 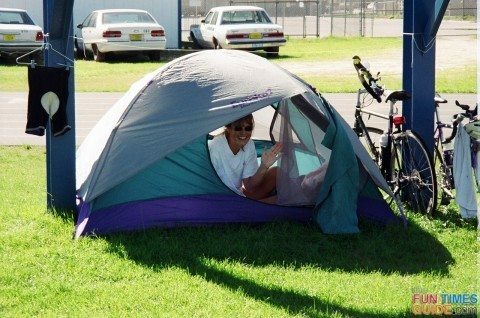 We would bike for days at a time, carrying all of our gear with us, and setting up camp each night. Needless to say, the lighter your gear, the better. Which is why these towels (used as bath towels & sweat rags) were a lifesaver! Fast-forward several years and about a thousand uses later… and I’m still singing the praises of these wonder towels. What Are These Towels Like? These super-absorbent towels go by many names: microfiber towels, pack towels, shammys, and super absorbent towels — to list just a few. The most popular ones are the Shamwow and The Absorber. Those are good, but my all-time favorite is the PackTowel (made by PackTowl). On first glance, these towels seem somewhat primitive, if not archaic, in design. In fact, when you first take one out of the package, it appears stiff, oddly shaped, and it barely even resembles a towel. The last thing you would think is that this towel could hold nearly 10 times its weight in liquid! That’s right… their strength is in their ability to absorb liquids lickety-split. From small spills to large puddles, nothing soaks it up faster than these towels. Not even a sponge! 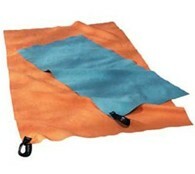 The original Pack Towel can absorb a full liter of water, and then release 90% of that liquid when you wring it out. Super absorbent viscose fiber absorbs up to 10 times its weight in liquid. The fast-drying material is biodegradable and reusable. Available in many different sizes and colors. Without a doubt, in our house these towels have been used mostly to soak up urine from the carpet every time puppy had an accident during housebreaking. They work wonders by wicking up the smelly stain in just minutes! 1. First, lightly dampen the entire towel, then completely wring out all of the water. 2. Place the damp towel on top of the stain or spill. 3. Immediately, press (don’t rub!) 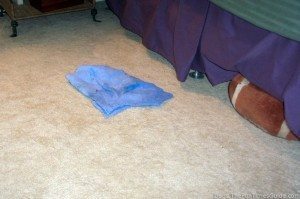 the towel onto the stain or spill — I usually step on it, or mash it with my hands. If the stain or spill is quite large, then the towel will have already soaked up a good portion of the mess, so go wring it out and re-dampen it with fresh water and proceed to Step 4. 4. Then, leave the dampened towel lying on top of the stain or spill for at least 30 minutes. 5. Finally, remove the towel from the stain or spill, rinse out, and launder with your other towels. They say you can wash these towels with the rest of your laundry… and you can even stick them in the dryer for faster drying! For the record, I do wash them with my normal loads of laundry, however I usually hang them to dry by poking them through the little slats on the shelf in my laundry room. If you choose to dry them in the dryer, you are not supposed to place dryer sheets in with these towels because they lessen the absorption properties of the towels. FYI… I have placed them in the dryer with dryer sheets before, and I haven’t ever noticed any difference in their absorption properties. However, I did notice they shrunk a bit after that first time in the dryer. Such is why I tend to just hang them to dry from a rack in the laundry room. You could dry them on low, as well. I’ve had my super-absorbent microfiber towels for well over 15 years, and they show absolutely NO sign of age. I’ve used them to clean up everything under the sun, and they have never become stained. I’ve washed them and dried them without any special attention (though I prefer to air dry them as a rule), and they are just as absorbent as they ever were. One of the coolest things I figured out a few years ago, is that you can cut them to size with a regular pair of scissors. This means you simply purchase one of the larger sized towels (I’ve done this with both the PackTowel and the Shamwow), then you cut it into several smaller towels. That way, you always have one on hand for whenever spills occur anywhere inside your home! I understand they’re making these towels now with “finished edges”, but you certainly don’t need anything fancy for cleaning up pet spills & stains. They’re also constantly updating these Pack Towels by changing the percentages of polyester and nylon — which gives a different (usually softer) texture, but also affects the absorbency. The official Pack Towels purchased from outdoor gear stores usually come with a big snap-closure loop on one end for hanging, drying, etc. Not only are they great around the house… they’re also great for camping! There have been many many knock-offs through the years, and I have tried several of them. The words “microfiber” and “shammy” (or chamois) have become popular phrases used with many different types of towels. They do not all perform the same. One thing I can tell you for sure… if it looks or feels like a real towel, then it’s not the super-absorbent kind that I’m referring to here in this article. The towels I’m referring to here are unique in that they look and feel more like cardboard until they are wet for the first time. Most other towels being marketed as microfiber simply do not absorb as well. Without a doubt, whenever I need a super-absorbent towel in a hurry, I always grab the original Pack Towel that I purchased years ago from REI. The only other microfiber towel that I’ve found comes close is the Original German Shammy. The Absorber towel performs the next best, in my opinion. The newest addition to this type of super-absorbent towel is Lightload Towels — which I like to keep in the car for pet & travel emergencies because they take up no space at all and they’re very similar in texture and absorbency. Shamwow vs Zorbeez: Which Works Better? Popular Mechanics: Does The Shamwow Really Work? Before you buy a Shamwow, make sure it’s “made in Germany” not just “German design” or some other creative wording. It’s the German-made Shammy that is the good one. If you have a dog, and you prefer to use a super-absorbent microfiber towel that’s designed specifically for pet use, then go for it. You may spend a little more for the cute design or unique shape, but there are some pet-friendly microfiber towels that work well too.